In 2012, former Honorable Minister of Internal Affairs, Wilbur Heine, led a delegation from the Republic of Marshall Islands (RMI) to the Disability Ministerial Meeting held in Papua New Guinea. As a result of the meeting, a training workshop on Disability Inclusive Development was held in Majuro by representatives from the Suva-based Pacific Disability Forum (PDF). The weeklong training workshop brought together persons with disabilities and interested stakeholders from Majuro Atoll and its capital city to discuss current and emerging issues on disability inclusive development in the RMI. The constitution states that no person may be treated in a discriminatory manner under law or by public officials, but it does not include disability in its listing of specific prohibited grounds of discrimination. In practice persons with physical, sensory, intellectual, and mental disabilities face difficulties in obtaining employment and accessing health care and other state services. There are no laws or policies designed to ensure access for individuals with disabilities to buildings, public transport, education, communications, or information. There are no building codes, and in practice most buildings are not accessible to persons with disabilities. Hospitals and two major grocery stores on Majuro have ramps for persons with disabilities. The lack of accommodations for people with disabilities is an ever more pressing challenge. It is expected that the numbers of persons with disabilities will increase due to high rates of diabetes-related amputations and blindness, increased traffic and industrial accidents, and the aging of the RMI population. With many competing priorities in an already strained fiscal environment, it is difficult for the RMI to identify sustainable financing for disabilities initiatives. One bright spot in this arena is disabilities services for children with special needs in the education system. Supported by funds from the U.S. Individuals with Disabilities Act, MOE is able to place special education teachers in over 90% of RMI public schools. The strong partnership between the RMI and the US in this area to provide services is a model to build upon. The interests of the disabled are further represented by two existing CSOs [civil society organizations], for disabled persons and parents of disabled persons respectively. The organizations of persons with disabilities in the Pacific region have been advocating for the adoption of government policy on persons with disabilities. In a 2013 policy development workshop, one speaker (Villaney Remengesou, President of Omekesang, an organization of persons with disabilities in Palau) stated that it was time to *2 work to protect the rights of persons with disabilities. People with disabilities have to be treated as equal community members. Another speaker (Laisiasa Merumeru, Disability Coordinator of the Pacific Islands Forum) stressed that People with disabilities have a lot to offer. There is hope for everyone. There is a problem in society when fellow human beings are not concerned (for others). The government disability program started way back in 1998. *3 In that year, the Nitijela of the Marshall Islands (parliament) adopted a resolution to “establish a local and regional comprehensive plan of services for persons with disabilities.” *4 At present, the Ministry of Education provides special education for children with disabilities in the school system, while the Ministry of Health has a department that deals with persons with disabilities. The government adopted the Marshall Islands National Policy on Disability Inclusive Development – 2014-2018 based on the 2009 Pacific Regional Strategy on Disability (PRSD), Incheon Strategy to Make the Right Real for Persons with Disabilities in the Asia Pacific Region 2013-2022 and the CRPD. The policy covers several priority areas, namely, operations of an inter-agency task force, the preparation of necessary legislations particularly to enshrine the “rights of persons with disability” and to amend existing laws to ensure that they are “aligned” with CRPD, ratification of CRPD, public awareness and advocacy on positive image of disability and persons with disabilities and on their needs and rights, employment and livelihood, access to health services, mainstreaming disability across RMI government and civil society, strengthening Marshall Islands Disabled Persons Organizations (MIDPO), and women with disabilities and youth with disabilities. The policy likewise refers to other international human rights instruments such as the Convention on the Rights of the Child (CRC) regarding measures for children with disabilities and the Convention on the Elimination of All Forms of Discrimination Against Women (CEDAW) for measures on women with disabilities. On 17 March 2015, RMI ratified the CRPD. With the ratification of CRPD, the government policy for persons with disabilities in general is now being finalized. The 2012 training workshop on Disability Inclusive Development led to the establishment of MIDPO. MIDPO aims to represent the common interests of persons with disabilities in the Marshall Islands. This aim is further elaborated as follows: 1) to promote and protect the rights and interests of persons with disabilities; 2) to facilitate opportunities for equal and full participation of persons with disabilities, their families, and communities through training, information dissemination, referral and support; and 3) to encourage and support independence, empowerment, and capacity building development of persons with disabilities. 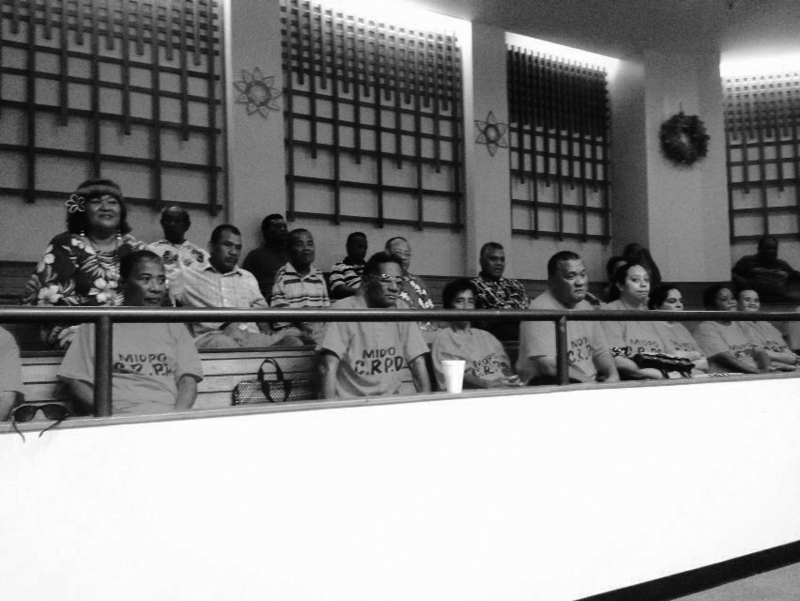 MIDPO serves as the central point to combine and oversees efforts for disabled persons in all of the Marshall Islands. To this end, MIDPO coordinates its efforts and works hand in hand with the RMI Ministry of Internal Affairs, the Public Service System and the Marshall Islands Disability Task Force. - Ongoing public awareness-raising activities on the CRPD. MIDPO is led by President Paul Maddison, Vice President Jackson Elcar, Treasurer Ricky Reimers, and Project Manager Florence Ned while the Secretary post is still vacant. It is apparent that PWD in RMI suffer discrimination and are thus often disadvantaged and marginalized, especially in regard to employment and general participation and inclusion in society. While the traditional approach is to care for vulnerable family members, cases of neglect and mistreatment are not unknown. Such attitudes and treatment mean that PWD are not able to fully enjoy their human rights as members of Marshallese society. Many words in the Marshallese language to describe disability or PWD have negative connotations that reinforce the stereotyped views of weakness, incompleteness, inadequacy or stupidity. The commonly used work mojno implies weakness. Assumptions about the causes of disability generally relate to punishments for women for actions during pregnancy; curses or punishment from God. Families with disabled family members are often embarrassed or ashamed. There is, therefore, a great need for advocacy and awareness raising on the rights of PWD to participate fully in society as equals. *Ms Amy Riklon is the Disability Coordinator in the Ministry of Internal Affairs, Republic of the Marshall Islands. *For further information, please contact: Amy Riklon, Disability Coordinator, Ministry of Internal Affairs, Republic of the Marshall Islands, P.O. Box 18, ph (692) 625-8240/8717; e-mail: amy.riklon@yahoo.com; and Florence Ned, Project Manager, Marshall Islands Disabled Persons Organization (MIDPO), P.O. Box 18, Majuro, Marshall Islands 96960; ph (692)625-8414. Ministry of Foreign Affairs, Republic of the Marshall Islands: National Report (Majuro, May 2013), page 15. This report was prepared for the Third International Conference on Small Islands States in Apia, Samoa held in 2014. Isaac Marty, “Disabled people policy needed,” The Marshall Islands Journal, 30 August 2013. See Annex 1, Republic of Marshall Islands National Policy on Disability Inclusive Development – 2014-2018. 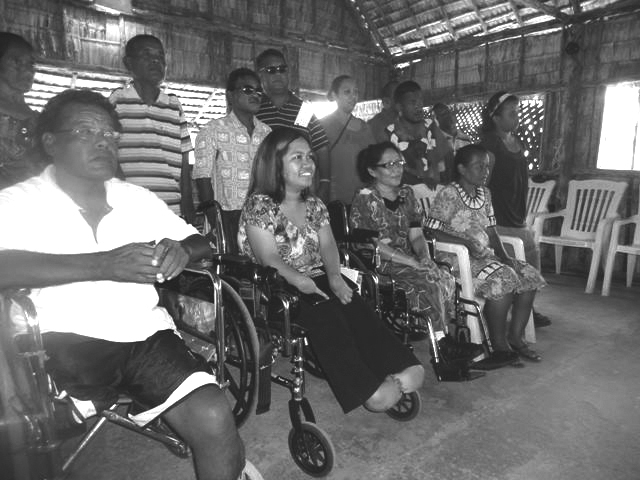 Republic of Marshall Islands National Policy on Disability Inclusive Development – 2014-2018, page 10.